Melt 25g unsalted butter in a heavy saucepan over medium heat. Add two finely chopped shallots and sauté until soft and translucent. Add 135g arborio rice and stir for 2 minutes. Add 225ml Champagne and simmer until almost all the liquid has evaporated, stirring often. Add 400ml chicken or vegetable stock and simmer for about 20 minutes or until the rice is tender but still firm, stirring often. Stir in 50g freshly grated Parmesan. Season and fold in a handful of freshly chopped herbs (parsley, basil, thyme, tarragon and mint are good). 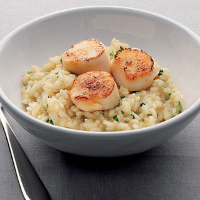 Serve warm, topped with seared scallops, roast lamb or a crisp-skinned fillet of salmon.